Well we all know the Indiana Jones film series. Personally, I rank the four movies 1 – 3 – 2 – 4, and I still love to watch them. It was very successful and even spawned a television series based on the main character’s youthful adventures called The Young Indiana Jones Chronicles that ran from 1992 to 1993. 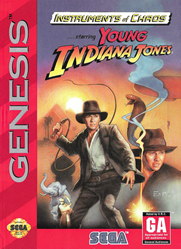 This series also prompted a Young Indiana Jones video game that, well… is complete crap. The story of the game centers around the Germans in World War 2, who are inventing terrible new weapons, and Indy is trying to prevent the weapons being made. Indy must stop a spy in each level from taking secrets back to Germany, or the Nazi war machine will become unstoppable. Sounds pretty plausible for a teenager, right? The first four levels can be chosen in any order and completing them will allow Indy to journey to Germany itself to stop the Nazis single-handedly, which we all know is his specialty. Well the game starts with a map of Europe there are five levels to play, and you can play them in any order you want. There’s Germany, Tibet, England, Egypt, and India; and all the levels are broken down into acts. There can be anywhere from two to four acts per stage. When you pick a level, you get a little briefing of what’s happening there, so you know your objectives. The levels themselves are overrun by little animals such as scorpions, crabs, ravens (those basted things), and more little critters from the deep and dark crawl ways of the world. My guess is that all the enemies who are standing in your way are waiting to get a mercy shot to the head, so they don’t have to be in this game anymore. You only have three weapons to use during the entire game. First, you have your trusty gun, which can shoot in three directions. Unfortunately, it’s useless against some enemies, such as many of the aforementioned little animals, who will simply crawl under your bullets. Your second weapon is Indy’s famous whip, but it’s so unresponsive that if you touch foes with it, they don’t recoil from the hit and instead just keep coming. You have to hope for some luck that you’ll kill them faster than they can reach you, but that’s never the case. The third weapon is the grenade, which is good for the bosses and breaking the glasses at the London Bridge. It’s not a weapon you’ll be using all the time, though. There are puzzles in each stage, like statues that you have to push and handles to grab, but they’re not too difficult. The real problem is found in the level design. Every stage is filled with sadistic stuff. For instance, in India in act one you need to get into a temple through a gate. To do this, you have to destroy six balls and chains. They’re located at the top of the level and to get there you must use your whip. The problem is that you are constantly attacked by ravens and monkeys, and the only way to kill them is with the whip. The sluggish controls ruin everything, resulting in cheap hits. If you want to grab something with the whip, like poles or stones, and swing on or to get higher, the action takes a long time, leaving you open for more cheap hits. If you succeed, you go to act inside the temple where you find yourself on an elephant. Here, you must whip statues above you, so you can open the door behind the big gold statue to get to act three. Here, there are balls and chains swinging, with deadly stakes above and under lava and a spike wall comes out in front and behind you. You have to whip the construction above you to to drive the wall back, but you are constantly getting attacked by those annoying birds that keep popping up from nowhere. Act four is where you face the boss, but it’s so easy that it’s laughable. You just stand there and shoot and throw grenades from a distance, and it’s over for him. Then the first level is done, and I lost half of my hair, as well as three Mega Drive controllers from throwing them across the room. My girlfriend scratched her head, probably asking herself what all those words I was just screaming for an hour and a half were. So, kiddies, if you’re still reading this, then we’re off to the other four stages of fun. Yes, they call this “fun.” Now, the other four stages are a more or less the same style with other puzzles to solve but the same crappy controls, annoying animals, and cheap deaths. London Bridge has lightning that pops up and is mostly too quick to avoid. Act two at Big Ben requires lots of luck, what with all the radars and the difficulty in getting up there. Egypt… ooh, do I love that level! Its first act features a sand storm that takes you all the way back to the beginning if it catches you. The enemies will hit you on your way, so get in a hole as fast as you can and wait until it’s over before moving on. Better yet, just take the game outside and destroy it. Struggle through a pyramid, journey miserably through Tibet and then a tower, and finally onto a German Zeppelin. Well that’s it. Now I’m going to cry, drink some whisky, and listen to some classic hard rock. Hopefully, I can forget this experience.